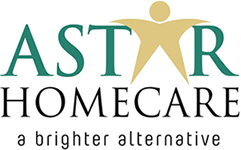 The Owners and Directors of AStar Homecare, Adam and Gillian Holden, between them, have a wealth of knowledge and experience, not only within the Care Sector but also in Leadership and Management. It is their aim to promote quality within the care sector and create a service that is truly about the people receiving our support and putting you at the heart of what we do. Both Adam and Gillian have their level 5 in Leadership and Management in Health and Social Care and strive to be an outstanding service. Both are very passionate about the wider community too and helping where they can.